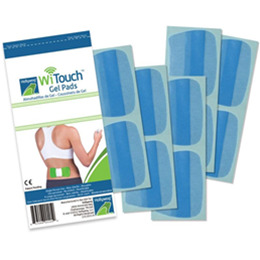 WiTouch® Gel Pads Reusable & ConvenientThe Hollywog® WiTouch Gel Pads adhere the WiTouch device to the skin and provide a dispersive medium between a patient’s skin and the electronic stimulation of the WiTouch’s built-in electrodes. Gel pads remove easily from a plastic backing and attach to the unit without any sticky residue or glues. Following treatments, pads can be covered with plastic backing for reuse in up to five additional applications, depending on skin type and preparation. Each pack comes with five pair of WiTouch Gel Pads for multiple pain relief applications.